This "Fox and the Four Seasons" wall hanging was made from my "Fox and the Four Seasons" quilt panel available for purchase as a fat quarter on Spoonflower.com. The bonus apple print strips on the outer sides of the panel were cut to make the central sashings. To make this wall hanging, fussy cut the fox blocks 8 x 8 inches, (finishing 7 1/2 x 7 1/2 inches) and the apple print sashing1 1/2 inches wide. Cut one of the apple strips to match your fussy cut fox block. Use the second strip as a single piece. With careful planning, the borders, backing and binding can be cut from 1 yard of coordinating fabric. This could make a great pillow cover too! Purchase more backing fabric if the pillow is to have an envelop closure. Want to make 4 small fox pillows, one for each season? The "Tossed Apples and Dots" fabric fat quarters and yardage. 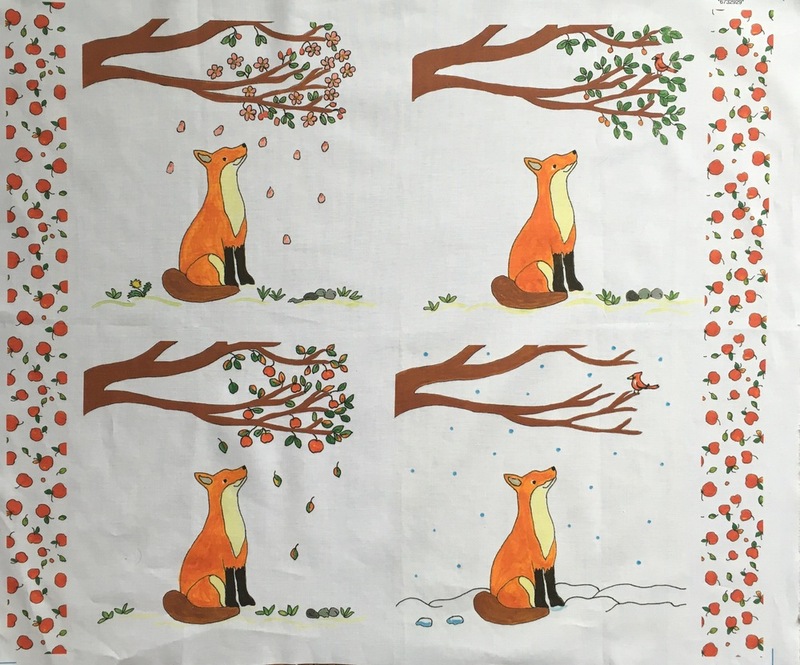 I'll post a quilt made from the "Fox and the Four Seasons" quilt panel soon!